The RTScript™ is a cDNA Synthesis Kit that allows users to produce robust cDNA yields in as little as 30 minutes. This kit is a modified version of M-MLV Reverse Transcriptase with RNase H activity deactivated and increased thermal stability. These characteristics render it sensitive, specific, and capable of synthesizing highly structured and long cDNA fragments. 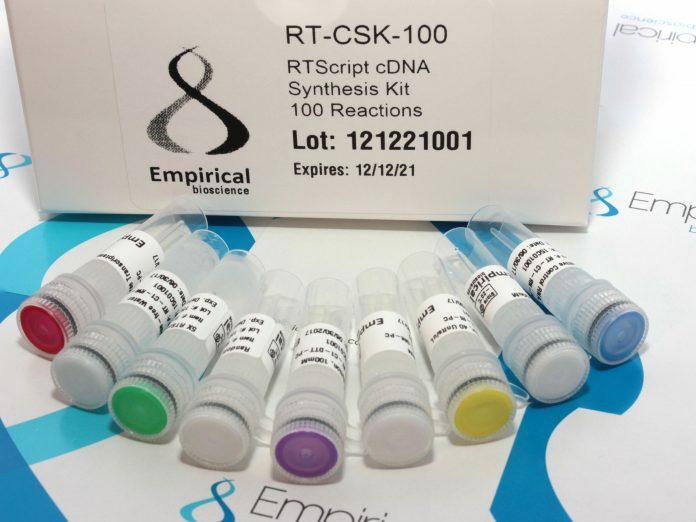 The RTscript cDNA Synthesis Kit has also been optimized to offer high reproducibility and efficiency for a broad range of primers and templates. The kit contains all the reagents necessary for first strand cDNA synthesis including RNase-free water, ultrapure dNTPs, oligo (dT) primers, random hexamers, control RNA, and RNase inhibitor.